There are houses that just take your breath away with their visual beauty. Today, we take a tour of exactly such a place in upscale neighbourhood of Stolpboerderij in Noord, Holland. Designed by Decoussemaecker Interieurs, interior architects based in Netherlands, this place evokes a sense of awe, such is its beauty. It is not just any particular element which contributes to this feeling; rather it a wholesome idea that comes out as you explore every nook and corner of this construction. 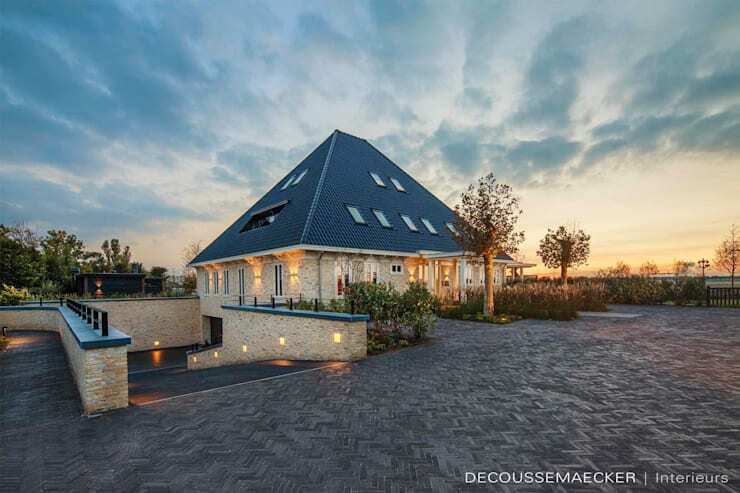 Homes in Netherlands are known for their ultra-modern experimental designs. These ultra-modern homes combine unconventional yet aesthetically and stylistically brilliant ideas to build something rare and unique out of the ordinary. Let’s take a tour of the house, which is waiting to be explored. Rising tall into the sky, the thatched roof of this house creates a wonderful picture. The blue roof looks so dainty that you will feel inspired to stay in this house. The combination of the stoned wall and the blue roof makes for great visuals. As you look at the vast expanse of space before the house, you simply absorb the fact that this house is designed for luxury and nothing else. The driveway is quite interesting. Made out of the same slate grey stone which covers the rest of the courtyard, it slowly creates a passage which leads to the main door which is daintily hidden. The garden is scattered, but this splurge of green creates a nice stir. This living room is nothing less than lavish. The large brown tones on the sofa, which covers almost the entire room, is perfect for entertaining a large group of guests. The center table is equally big matching up with unique U-shaped sofa. 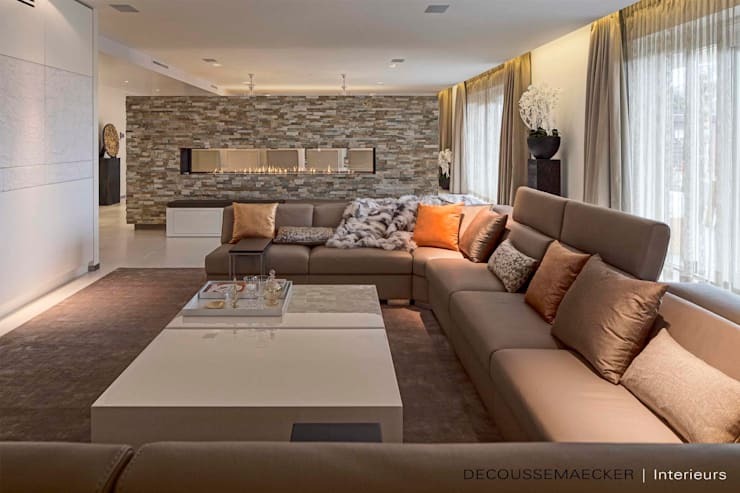 Colourful cushions like orange and golden are arranged nicely on the sofa along with the beautiful brown cushions. The cushions are large, keeping in sync with the overall demeanour. The stone feature wall by the side is a vision in beauty. In front of the sofa, there is one white wall, which is a cleverly-hidden cabinet. One single state-of-the-art flat screen TV adorns it. The decor in the living space is at times larger than life, but considering the house itself the decor does not seem out of place. The first word that pops out of your mouth when you see this kitchen is wow. 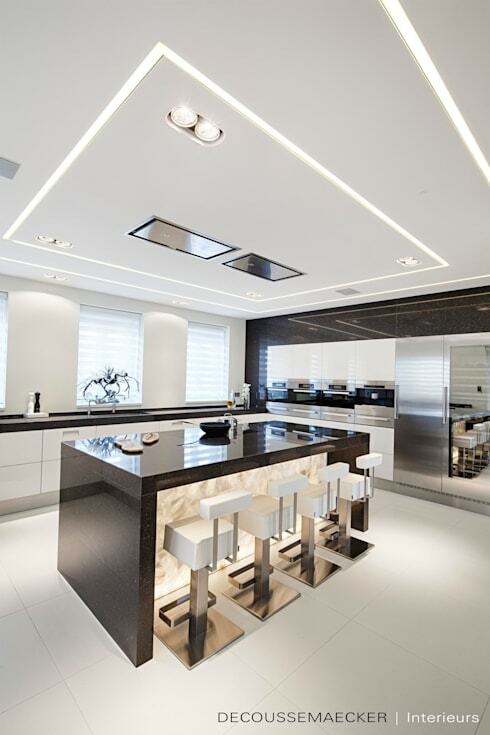 This wow factor is present in every inch of this posh kitchen. The smooth polished kitchen island in the middle looks sleek and suave. The contrast of the black table and white chairs create quite a nice picture. If there is anything which can be called post-modern design, the chairs stand true for that concept. This modular kitchen truly shows the meaning of a neat and tidy space. Everything is intelligently hidden behind the doors and you have an uncluttered vision. The concealed lights on the ceiling, the white tiled floor, the glass wall and the state-of-the-art infrastructure contributes to the feeling of classiness which the place exudes. If there is anything that your bedroom should be, it's inviting . One look at this beautiful bedroom and you think how perfectly it captures the meaning of that word. The structure of the roof clearly shows that it is positioned in the upper storey. The slanting roof with a large window creating space for ample flow of light is quite interesting. 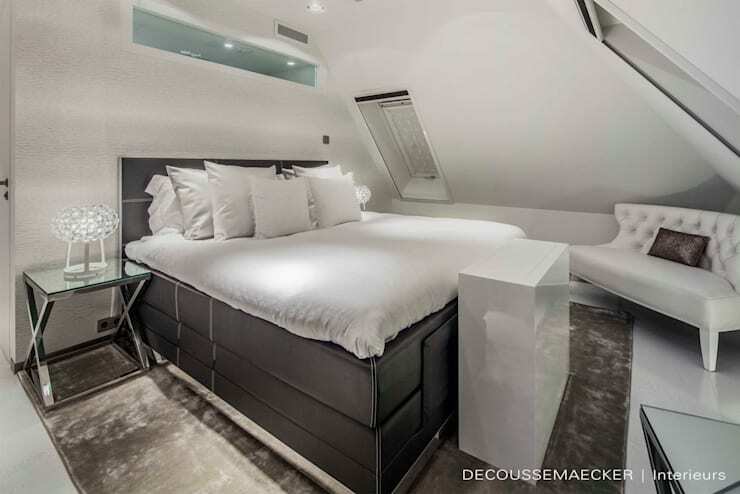 But it is the bed which will be the highlight of this place. Soft and inviting, the bed has a cosy feel. Also, like many other parts of the house, the black and white contrast works perfectly for this room as well. The side table is very sleek with an abstract lamp shaped on it. There is a single couch by the side; extremely Victorian by the look of it and adding dollops of charm to the room. As you enter this room, the large bathtub is the first thing that you notice. 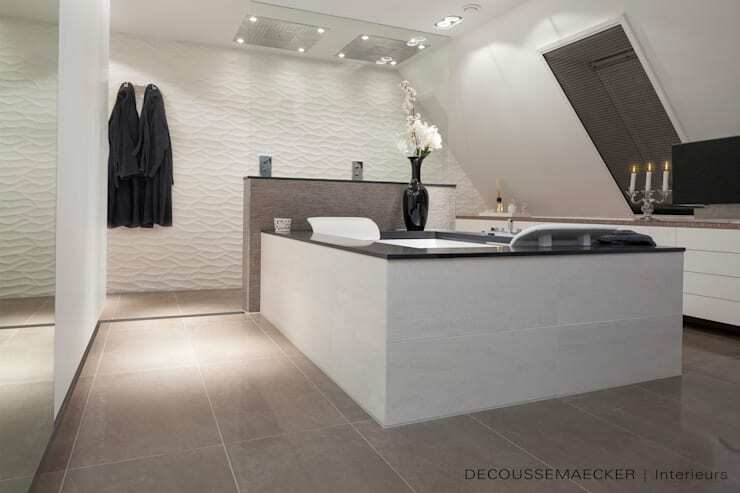 It is said that bathrooms should evoke a feeling of relaxation. And this space precisely contributes to this emotion. In modern colour palette, most of the chosen colours stick to soothing ones. Probably the use of white, grey and black is deliberate. A large black vase containing white flowers stand on one side of the tub creating a happy feel about the house. As you look at the slanting roof at the side, you notice three candles burning in unison. It totally contributes to the romantic ambience of the place. 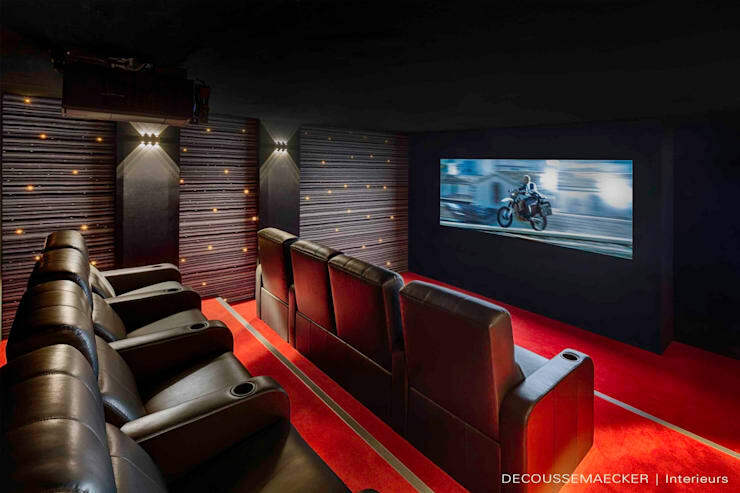 If you had stopped your journey at the bathroom, you would have probably missed the most unique feature of the—a unique mini theatre, perfect for your own private screenings. This hall gives you the feel of a real movie theatre. The red carpet, the plush sofas and the large flat screen state-of-the-art TV complete the picture. So, what are you waiting for? Bring in the popcorn and sit for a relaxed viewing of your favourite movie. Its here that we complete the tour of this beautiful house. As you complete it, there is feeling of an urge inside of wanting to know it even better. That is what defines a beautiful house! If you are inspired by this house tour, here is another one that is must take a look at: A One Room Flat Gets New Life! What do you like most about this tour? Please share with us in your comments below.